Fried ravioli, a popular appetizer in St. Louis, Missouri, is breaded and deep-fried pasta. If frying pasta sounds strange to you, keep an open mind: crispy pasta shell, soft cheese filling and ample marinara sauce for dipping; what's not to like? 1. Pour enough olive oil into a large frying pan to reach a depth of 2 inches. Heat the oil over medium heat until a deep-fry thermometer registers 325ºF. 2. While the oil is heating, put the buttermilk and the bread crumbs in separate shallow bowls. Working in batches, dip ravioli in buttermilk to coat completely. Allow the excess buttermilk to drip back into the bowl. Dredge ravioli in the bread crumbs. Place the ravioli on a baking sheet, and continue with the remaining ravioli. 3. When the oil is hot, fry the ravioli in batches, turning occasionally, until golden brown, about 3 minutes. Using a slotted spoon, transfer the fried ravioli to paper towels to drain. 4. 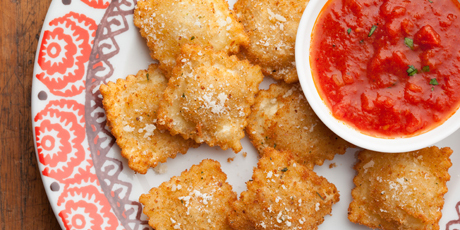 Sprinkle the fried ravioli with Parmesan and serve with a bowl of warmed marinara sauce for dipping.